For quantitative determination of aspartate transaminase (AST) activity and evaluation of drug effects on AST activity. Aspartate Transaminase (AST), also known as serum glutamic oxaloacetic transaminase (GOT) or aspartate aminotransferase (ASAT/AAT), facilitates the conversion of aspartate and a-ketoglutarate to oxaloacetate and glutamate. There are two isoenzymes in humans: GOT1 is a cytosolic isoenzyme derived from red blood cells and heart; GOT2 is the mitochondrial isoenzyme found mainly in the liver. AST is elevated in liver and muscle diseases. It is part of diagnostic tests for liver function, myocardial infarction, acute pancreatitis, acute hemolytic anemia, severe burns, acute renal disease and trauma. Simple, direct and automation-ready procedures for measuring AST activity find wide applications in research and drug discovery. 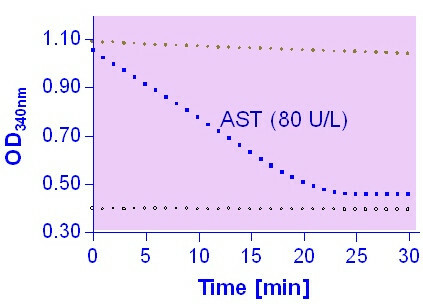 BioAssay Systems’ AST activity assay is based on the quantification of oxaloacetate produced by AST. In this assay, oxaloacetate and NADH are converted to malate and NAD by the enzyme malate dehydrogenase. 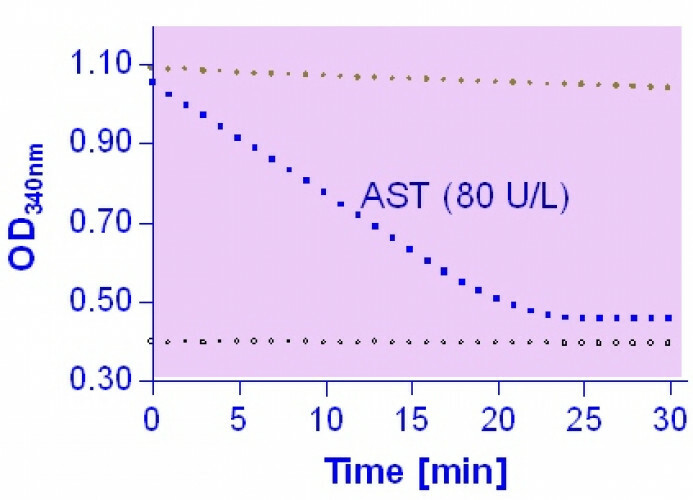 The decrease in NADH absorbance at 340 nm is proportionate to AST activity. Applications For quantitative determination of aspartate transaminase (AST) activity and evaluation of drug effects on AST activity. References Assay: Aspartate Transaminase in Hen serum (Pubmed).